Purpose built catamaran workboat. Delivers granite moorings. Installs helical anchors, steel mushrooms and pyramid moorings. Catamaran Barge: Fast, efficient, and safe. We can operate in shoal water and in tight anchorages with pin-point accuracy. The fiberglass barge is fully fendered, for "mark free" rafting with customer boats. 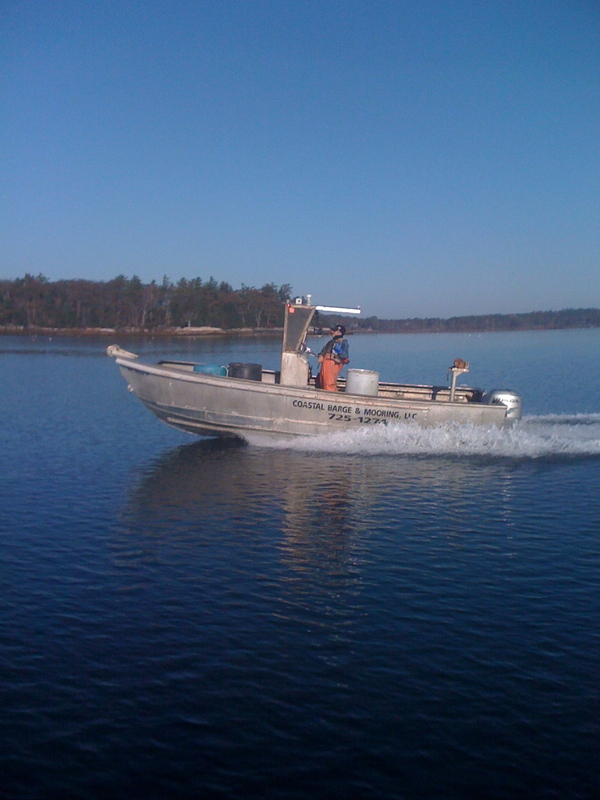 Our fleet of two aluminum workboats are fast and efficient. We can deploy boat and diver and arrive to any of our service areas in less than 45 minutes. Includes removing the customers mooring ball in the Fall, checking pennant, swivel, shackles for wear, cleaning and then returning the ball in the Spring. We also record GPS Coordinates. In place of the mooring ball we attach a Winter spar. Attached to the spar is sufficient line to allow the mooring chain to be dropped to the bottom. Taking the mooring "off-line" for six months significantly reduces chain wear. Does not include Dive Inspection. Is your mooring ready for the big blow? Your mooring should be inspected every three years, however, some towns require more frequent inspections. The town of Freeport, Maine, for example, requires a mooring inspection every two years. Always check with the local harbormaster regarding how often the mooring should be inspected and who the reliable service providers are in your area.